Want to import hundreds of contacts into your new smart phones? With the help of vCard you can store contacts information like your company name, telephone number, fax numbers, email address and other details. vCard is used in different kinds of cell phones, iPhone, Smart phone and PDA devices. It is not possible to directly import excel contacts into vCard. 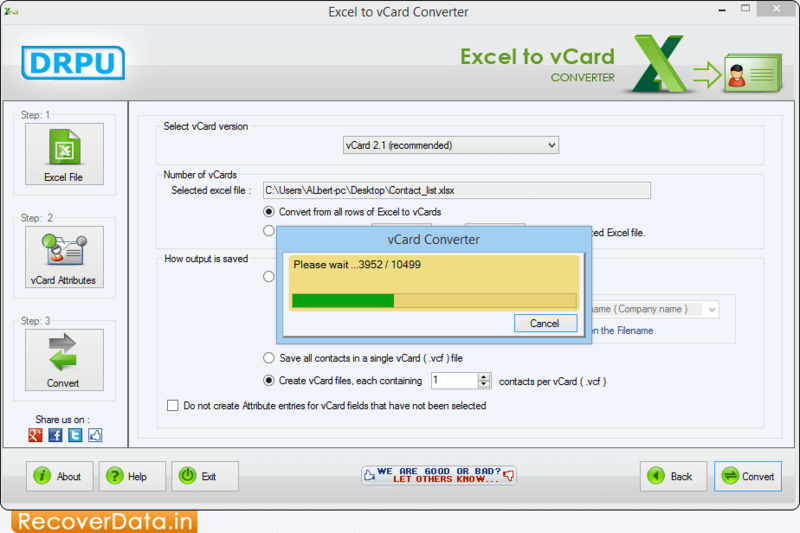 Using Excel to vCard Converter program, you can quickly convert your selected or whole contacts stored in excel into VCF file formats. Now you can easily convert contacts saved in Microsoft excel into vCard contacts for social networking websites including Facebook, Google+, Linkedin, Twitter etc. Supports batch conversion of contacts saved in excel files into vCard format. Easily export contacts list stored in MS Excel file into vCard file format. Converts unlimited numbers of contacts from Excel file into .VCF file format. No need to install MS Outlook on your PC to convert contacts saved in Excel to vCard. Supports all latest versions of Windows operating system.